This is an excellent post on the management of supratherapeutic INR in patients taking vitamin K antagonist therapy – and as you described, there is not a one-size-fits-all approach. Warfarin is notorious for being one of the most difficult medications to manage based on narrow therapeutic index, variable dose response, clinically significant diet- and drug- drug interactions, delayed onset and offset of action and the need for frequent monitoring. Fortunately, warfarin does have an antidote in vitamin K. Yet, the choice of when to administer this antidote (and weaknesses of said antidote), along with other therapies including prothrombin complex concentrates (PCCs) and fresh frozen plasma, are not straightforward and depend upon a number of factors. In addition to your excellent teaching points, I have outlined some additional considerations below. In the setting of life-threatening bleed, guidelines dictate our therapeutic approach, which involves holding warfarin and administering 4-factor PCC and intravenous vitamin K (10mg slow infusion over 20-60 minutes)1. The management of life-threatening bleeding is clear and requires aggressive therapy. But how do we manage the patient who has a moderately elevated INR but only a minor bleed? In the setting of minor bleeding (such as intermittent epistaxis), the goal is restore the INR to target range, without leading to subtherapeutic anticoagulation, thus introducing the risk of thrombosis. There is general consensus regarding holding a dose of warfarin in these scenarios but the choice to administer vitamin K has been debated. The choice of approach should depend upon the perceived risk of bleeding, extent of bleed, site of bleed, INR level (and trend in INR), comorbidities (including indication for anticoagulation) and risk of thromboembolism. The downsides to administering vitamin K are worth mentioning as they are sometimes superseded by our focus on providing active treatment (unquestionably necessary in the case of life-threatening bleed). Excessive vitamin K dosing may result in warfarin resistance for 1-2 weeks which may require extensive bridging therapy once anticoagulation is restarted. For patients with high thromboembolic risk, poor adherence to medications, higher INR goals or comorbidities, this can become complicated and is certainly not without risk. The 2012 ACCP guidelines recommend administration of oral vitamin K (2.5-5mg) to patients without an active bleed who have an INR>10 (1). Other experts and the 2008 ACCP guidelines use a more conservative cutoff of 9 (2). For those patients with INRs between 4.5 and 10 without evidence of bleeding, the 2012 ACCP guidelines suggest against the routine use of vitamin K. In this post, you make a great point regarding the management of INRs 5-9 without bleeding. That is, the administration of vitamin K may or may not be administered, depending on the risk of bleeding. Low dose vitamin K administration should be more strongly considered in patients with high risk bleed (elderly, prior bleed) and lower risk of thromboembolism. 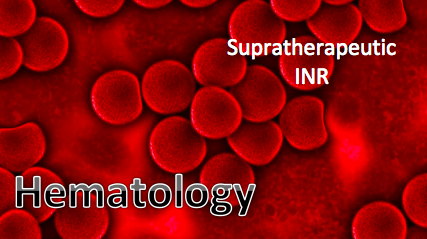 A retrospective review of 633 patients with elevated INR >6 identified risk factors for slow spontaneous lowering of supratherapeutic INR, including older age, higher index INR, lower warfarin maintenance dose, decompensated heart failure and active cancer (3). Knowledge of these risk factors may help guide decision-making when considering whether or not to administer vitamin K.
Patients meriting further discussion are those taking vitamin K antagonists who require urgent (same day) surgeries or invasive procedures. These patients are managed in a similar fashion to those with life threatening bleeding – that is to say, vitamin K (10mg IV) and 4-factor PCC. Of note, for those patients who can wait 24 hours, low dose vitamin K (1-2.5mg PO) is generally adequate for INR reversal. In these cases, 4-factor PCC and intravenous vitamin K can be avoided. Vitamin K (phytonadione): typically administered intravenous or orally. In short, patients with life-threatening bleed taking vitamin K antagonist therapy require urgent evaluation and treatment with PCC and IV vitamin K. Treatment with PCC is paramount as INR can be corrected within 30 minutes, as opposed to several hours after IV vitamin K administration (onset dependent upon liver synthesis of new coagulation factors). For those patients with supratherapeutic INR without bleeding and patients with minimal bleed, a more gentle approach is indicated, which involves omission of warfarin dose +/- low doses of oral vitamin K to ensure correction of INR and prevention of bleeding but not subtherapeutic anticoagulation. Lastly, it is important to identify if there are additional explanations for the supratherapeutic INR by verifying if the patient was taking the appropriate dose of warfarin or whether they have recent dietary changes or new medications which may interact. If therapy is to be resumed, these questions are particularly helpful when deciding how and when to restart anticoagulation. Holbrook A, Schulman S, Witt DM, et al. Evidence-based management of anticoagulant therapy: Antithrombotic Therapy and Prevention of Thrombosis, 9th ed: American College of Chest Physicians Evidence-Based Clinical Practice Guidelines. Chest 2012;141(2 Suppl):e152S. Ansell J, Hirsch J, Hylek E, et al. Pharmacology and management of the vitamin K antagonists: American College of Chest Physicians Evidence-Based Clinical Practice Guidelines (8th Edition). Chest 2008;133(6 Suppl):160S. Hylek EM, Regan S, Go AS, Hughes RA, Singer DE, Skates SJ. Clinical predictors of prolonged delay in return of the international normalized ratio to within the therapeutic range after excessive anticoagulation with warfarin. Ann Intern Med. 2001;135(6):393. Posted on October 8, 2018 by NUEM Blog and filed under Hematology and tagged INR Coumadin Vitamin K Warfarin.